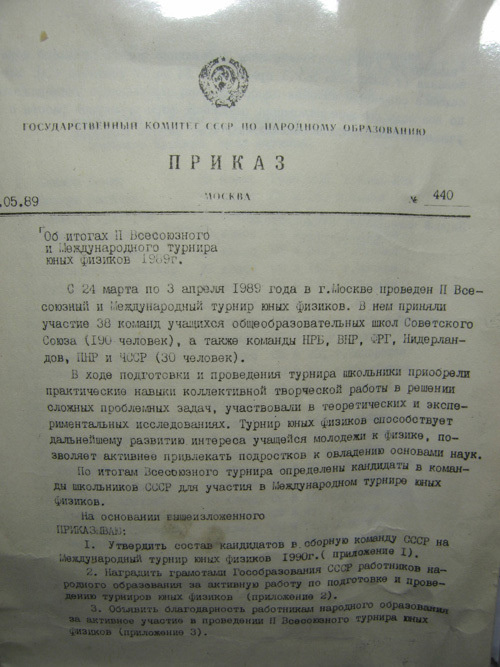 Grigory Kopelevich, Vasily Shabat, and Alexander Yablonskiy, members of the silver-winning Soviet team from Moscow School 710 at the 2nd IYPT, confirm several details of the event. 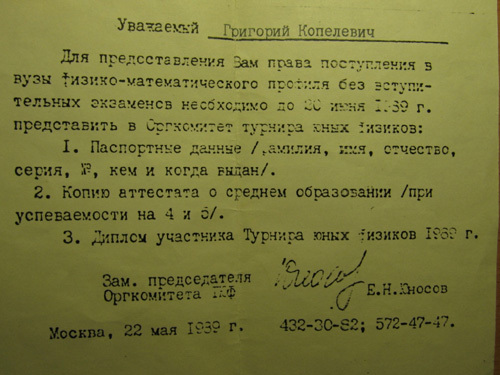 Valuable original records of 2nd and 5th IYPTs are shared by Grigory Kopelevich. Grigory Kopelevich is now the Moscow Office Head at Howard Hughes Medical Institute. Vasily Shabat is now CEO of Tilbi, a Russian startup IT company. Alexander Yablonskiy is now a theoretical researcher in semiconductor nanosctructures at the General Physics Institute of Russian Academy of Sciences, Moscow. I. M. There are ongoing doubts about the problems for 1989. What published in Kvant in Summer 1988, differs seriously from the later problem sets, where 9 out of 17 problems are fully replaced. Can you possibly shed more light on the problems used at the final rounds in 1989? G. K. I agree that in 1989, the Kvant problems were not the ultimate ones. What is published in Czech language looks correct – I reported personally problems on Clock and Rainbow, that are missing in Kvant. Does the Noon match with the moment when the Sun is at a highest point above the Horizon, and if no, what is the time lag? What should be the properties of a board fence so that objects behind the fence are visible from a car driving nearby? How to measure the speed of a metro train in an arbitrary point between the stations Universitet and Prospekt Vernadskogo? How much information does a color map of the World contain? A. Ya. I am still in contact with my teammates and competitors, e.g. with Alexander Dunaevsky, who now resides and works in Germany, so I should ask them if they have preserved anything. The only thing I can say for sure, is that I was solving this problem No. 313, Electron. G. K. Possibly, some additional materials might have been kept at our School 710, but the team of physics teachers changed much since that time. 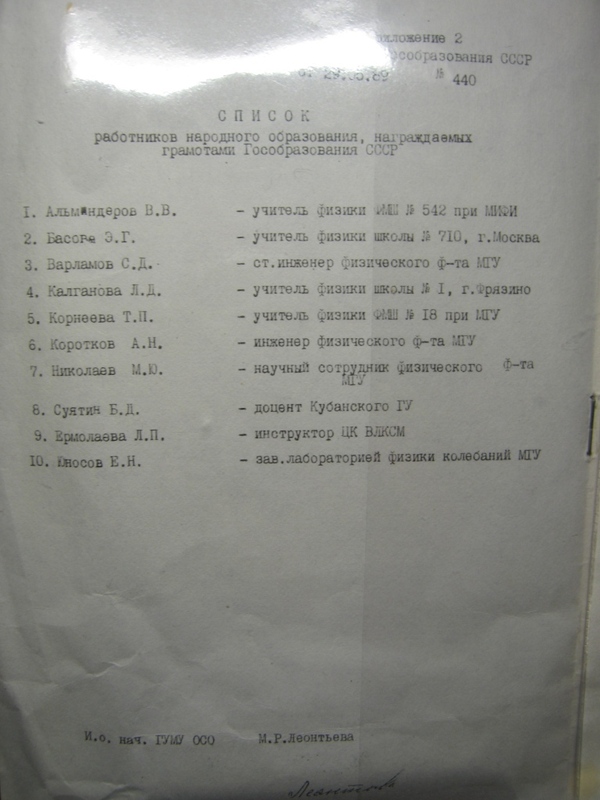 I. M. There is a source reporting that the second place, or silver, was awarded to an unidentified Soviet team. Do you possibly remember, if that was your team, or Odessa? V. Sh. As far as I remember, it was us. Actually, we won the Soviet pre-selection (when competing to Moscow School 18 and MEPhI’s school 542) and then passed to the International Finals that were, by the way, far less tense and passionate than the Soviet finals. 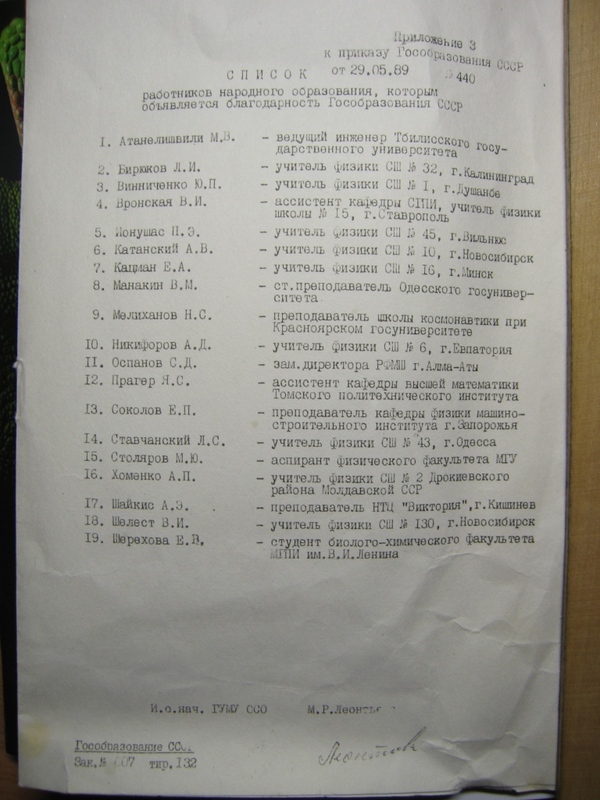 You possibly know that the most successful participants of YPT-1989 were allowed to join any science- or technology-oriented university in USSR (an institute or a university proper) without inscription examinations. There was a list of people who got this right. I. M. If I am not mistaken, the International Finals in 1989 were hosted in Russian, but the West German team had special interpreters. V. Sh. Everything was positively held in Russian only. I do not remember who, and in what way, provided interpretation. I. M. Did you possibly preserve any original materials from the event? 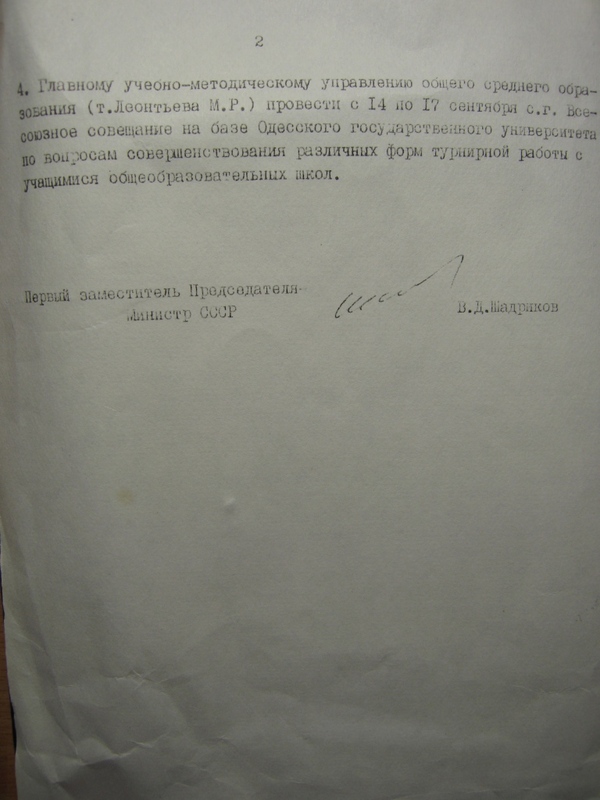 G. K. The diploma was taken back by the head of YPT, Evgeny Nikolaevich Yunosov. It was necessary to issue an ID to be enrolled to Moscow State University without examinations, and I never saw it again. I attach all YPT-related materials I found at my place. 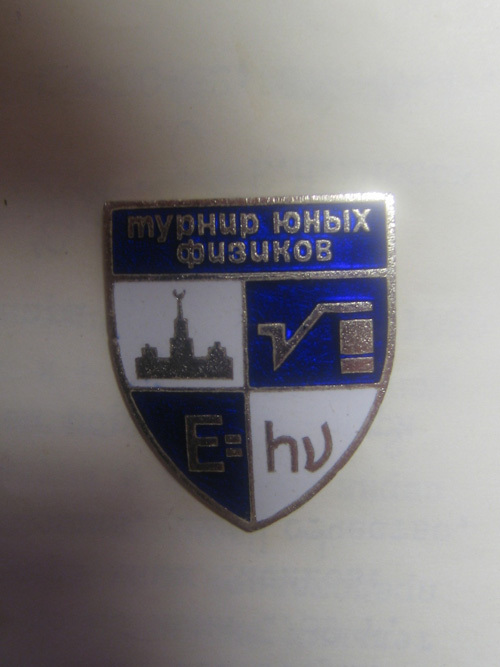 I just noticed in your blog that you have already seen the badge and the cover for the diplomas. 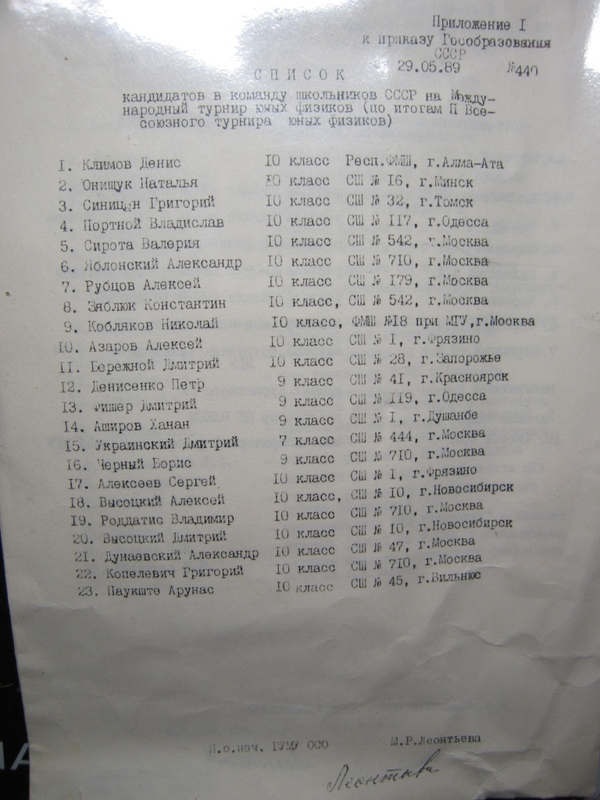 For an unknown reason, I have preserved the problems for the 5th International YPT – I remember that as a university student I was assisting Yunosov in arranging at least two YPTs, and possibly the 5th IYPT was among them. I. M. Were these problems published in a booklet, or are just a separate handout? I will let you know if I find anything else. 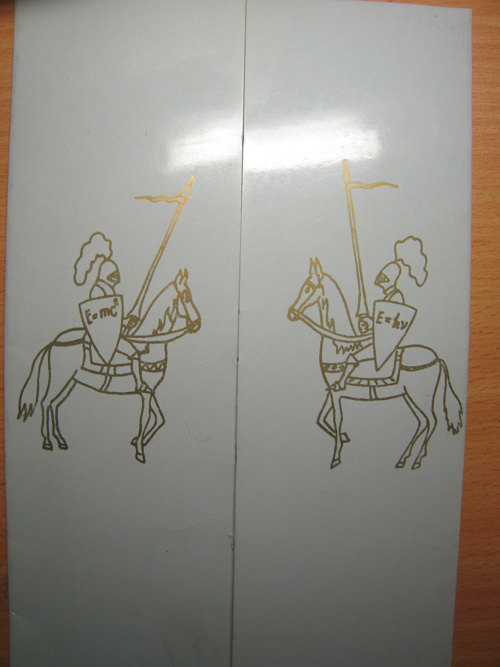 Thank you for an unexpected message and the interest in the YPT history. The interview and the exchange of materials were undergone on December 3-6, 2010.